The Land Rover Range Rover Sport is a jack-of-all-trades and a master of many. It isn’t quite as luxurious as the top-of-the-line Range Rover, but it’s sportier. It sits lower than that vehicle, so it’s not quite as capable off-road, but it can still handle itself well when the pavement ends. 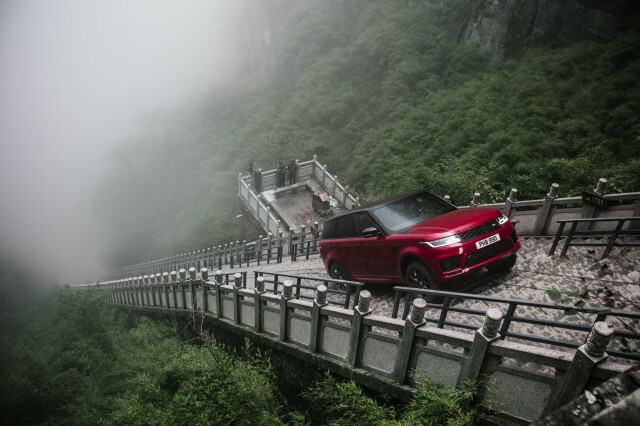 This combination of on-road dynamics and off-road capability made it the perfect choice for Land Rover’s latest stunt: A high-speed run on China’s Dragon Road, followed by a climb up the steps at the end of that road to the legendary Heaven’s Gate rock formation. It was a simple matter of 99 turns, followed by 999 steps taken at a 45-degree angle. Land Rover tapped Panasonic Jaguar Racing’s Ho-Pin Tung to make the run, and outfitted the Range Rover Sport with reinforced tires to deal with the punishment they would receive on their way up the steps. Tung ran the RR Sport in the Terrain Response System’s Dynamic mode on the beautiful mountain road switchbacks of the 7-mile Tianmen Mountain Road, then switched over to an undisclosed off-road mode or modes for the 999 steps. Plenty of vehicles have run the mountain road, including daily tour buses, but no vehicle has ever run up the steps to the beautiful Heaven’s Gate. Land Rover produced the video above of the record attempt, interviewing locals about the prospects for success. As you can see when you click on the video about, they think it’s impossible. The total run took 20 minutes and 47 seconds, making it a record, since no vehicle had ever climbed the steps before. That, of course means that someone else will have to come along and try to break it. This isn’t the first crazy stunt Land Rover has pulled off to show the capability of the Range Rover Sport. In 2016, Ben Collins drove a Range Rover Sport down a downhill ski course in Switzerland. In 2013, the company set a record with a Range Rover Sport for driving across Saudi Arabia’s Empty Quarter desert. That same year, Land Rover set a record for a production SUV at the Pike’s Peak hill-climb. This one may have been crazier, though. With that 45-degree angle, if Tung would have made a mistake, it could have become a very dangerous situation. Maybe that’s why nobody had tried it before.